This cool space wallpaper is an illustration showing HD 189733b, a huge gas giant that orbits very close to its host star HD 189733. This cool space wallpaper is an illustration showing HD 189733b, a huge gas giant that orbits very close to its host star HD 189733. The planet's atmosphere is scorching with a temperature of more than 1000 degrees Celsius, and it rains glass, sideways, in howling 4350 mile-per-hour (7000 kilometer-per-hour) winds. 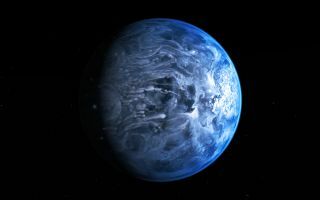 By observing this planet before, during, and after it disappeared behind its host star during orbit, astronomers were able to deduce that HD 189733b is a deep, azure blue—reminiscent of Earth's color as seen from space. This image was released July 11, 2013.